Article 14a of Directive 97/68/EC sets out the criteria and the procedure for extending the period referred to in Article 9a(7) of that Directive. Studies carried out in accordance with Article 14a of Directive 97/68/EC show that there are substantial technical difficulties to comply with stage II requirements for professional use, multi-positional, hand-held mobile machinery in which engines of classes SH:2 and SH:3 are installed. It is therefore necessary to extend the period referred to in Article 9a(7) until 31 July 2013. Since the amendment of Directive 97/68/EC in 2004, technical progress has been made in the design of diesel engines with a view to make them compliant with the exhaust emission limits for stages IIIB and IV. Electronically controlled engines, largely replacing mechanically controlled fuel injection and control systems, have been developed. Therefore, the current general type-approval requirements in Annex I to Directive 97/68/EC should be adapted accordingly and general type-approval requirements for stages IIIB and IV should be introduced. Annex II to Directive 97/68/EC specifies the technical details of the information documents that need to be submitted by the manufacturer to the type-approval authority with the application for engine type-approval. The details specified regarding the additional anti-pollution devices are generic and should be adapted to the specific after-treatment systems that need to be used to ensure that engines comply with exhaust emission limit stages IIIB and IV. More detailed information on the after-treatment devices installed on the engines should be submitted to enable type-approval authorities to assess the engine’s capability to comply with stages IIIB and IV. Annex III to Directive 97/68/EC sets out the method testing the engines and determining their level of emissions of gaseous and particulate pollutants. The type-approval testing procedure of engines to demonstrate compliance with the exhaust emission limits of stage IIIB and IV should ensure that the simultaneous compliance with the gaseous (carbon monoxide, hydrocarbons, oxides of nitrogen) and the particulate emission limits is demonstrated. The non-road steady cycle (NRSC) and non-road transient cycle (NRTC) should be adapted accordingly. Point 1.3.2 of Annex III to Directive 97/68/EC foresees the modification of the symbols (section 2.18 of Annex I), the test sequence (Annex III) and calculation equations (Appendix III to Annex III), prior to the introduction of the cold/hot composite test sequence. The type approval procedure to demonstrate compliance with the exhaust emission limits of stage IIIB and IV requires the introduction of a detailed description of the cold start cycle. Section 3.7.1 of Annex III to Directive 97/68/EC sets out the test cycle for the different equipment specifications. The test cycle under point 3.7.1.1 (specification A) needs to be adapted to clarify which engine speed needs to be used in the type approval calculation method. It is also necessary to adapt the reference to the updated version of the international testing standard ISO 8178-4:2007. Section 4.5 of Annex III to Directive 97/68/EC outlines the emissions test run. This section needs to be adapted to take account of the cold start cycle. Appendix 3 of Annex III to Directive 97/68/EC sets out the criteria for the data evaluation and calculation of the gaseous emissions and the particulate emissions, for both the NRSC test and the NRTC test set out in Annex III. The type approval of engines in accordance with stage IIIB and IV requires the adaptation of the calculation method for the NRTC test. Annex XIII to Directive 97/68/EC sets out the provisions for engines placed on the market under a ‘flexible scheme’. To ensure a smooth implementation of stage IIIB, an increased use of this flexibility scheme may be needed. Therefore, the adaptation to technical progress to enable the introduction of stage IIIB compliant engines needs to be accompanied by measures to avoid that the use of the flexibility scheme may be hampered by notification requirements which are no longer adapted to the introduction of such engines. The measures should aim at simplifying the notification requirements and the reporting obligations, and at making them more focused and tailored to the need for market surveillance authorities to respond to the increased use of the flexibility scheme that will result from the introduction of stage IIIB. Since Directive 97/68/EC provides for the type-approval of stage IIIB engines (category L) as from 1 January 2010 it is necessary to provide for the possibility to grant type approval from that date. For reasons of legal certainty this Directive should enter into force as a matter of urgency. Annex XIII is amended in accordance with Annex V to this Directive. With effect from the day following the publication of this Directive in the Official Journal, Member States may grant type-approval in respect of electronically controlled engines which comply with the requirements laid down in Annexes I, II, III, V and XIII to Directive 97/68/EC, as amended by this Directive. 1. Member States shall bring into force the laws, regulations and administrative provisions necessary to comply with the Directive within 12 months after the publication of the Directive. They shall forthwith communicate to the Commission the text of those provisions. They shall apply those provisions from 31 March 2011. Done at Brussels, 31 March 2010. (1) OJ L 59, 27.2.1998, p. 1. 8.1. This section shall apply to the type-approval of electronically controlled engines, which uses electronic control to determine both the quantity and timing of injecting fuel (hereafter “engine”). This section shall apply irrespective of the technology applied to such engines to comply with the emission limit values set out in sections 4.1.2.5 and 4.1.2.6 of this Annex. 8.2.1. “emission control strategy” means a combination of an emission control system with one base emission control strategy and with one set of auxiliary emission control strategies, incorporated into the overall design of an engine or non-road mobile machinery into which the engine is installed. 8.2.2. “reagent” means any consumable or non-recoverable medium required and used for the effective operation of the exhaust after-treatment system. 8.3.1.2. Any base emission control strategy that can distinguish engine operation between a standardised type approval test and other operating conditions and subsequently reduce the level of emission control when not operating under conditions substantially included in the type approval procedure is prohibited. where the auxiliary emission control strategy is not activated during the type approval test, it must be demonstrated that the auxiliary emission control strategy is active only for as long as required for the purposes identified in section 8.3.2.3.
the engine coolant temperature above 343 K (70 °C). Where the auxiliary emission control strategy is activated when the engine is operating within the control conditions set out in points (a), (b) and (c), the strategy shall only be activated exceptionally. if used to trade-off the control of one regulated pollutant under specific ambient or operating conditions, for maintaining control of all other regulated pollutants, within the emission limit values that are appropriate for the engine concerned. The purpose is to compensate for naturally occurring phenomena in a manner that provides acceptable control of all emission constituents. 8.3.2.4. The manufacturer shall demonstrate to the technical service at the time of the type-approval test that the operation of any auxiliary emission strategy complies with the provisions of section 8.3.2. The demonstration shall consist of an evaluation of the documentation referred to in section 8.3.3. 8.3.2.5. Any operation of an auxiliary emission control strategy not compliant with section 8.3.2 is prohibited. the tolerance used to satisfy the requirements in section 8.4.7.2, regardless of the used means. 8.3.3.2. The additional material referred to in point (b) of section 8.3.3.1 shall be treated as strictly confidential. It shall be made available to the type-approval authority on request. The type-approval authority shall treat this material as confidential. 8.4.1. The manufacturer shall provide information that fully describes the functional operational characteristics of the NOx control measures using the documents set out in section 2 of Appendix 1 to Annex II and in section 2 of Appendix 3 to Annex II. 8.4.2. If the emission control system requires a reagent, the characteristics of that reagent, including the type of reagent, information on concentration when the reagent is in solution, operational temperature conditions and reference to international standards for composition and quality must be specified by the manufacturer, in section 2.2.1.13 of Appendix 1 and in section 2.2.1.13 of Appendix 3 to Annex II. 8.4.3. The engine emission control strategy shall be operational under all environmental conditions regularly pertaining in the territory of the Community, especially at low ambient temperatures. 8.4.4. The manufacturer shall demonstrate that the emission of ammonia during the applicable emission test cycle of the type approval procedure, when a reagent is used, does not exceed a mean value of 25 ppm. 8.4.5. If separate reagent containers are installed on or connected to a non-road mobile machine, means for taking a sample of the reagent inside the containers must be included. The sampling point must be easily accessible without requiring the use of any specialised tool or device. no deliberate misuse of the engine has taken place, in particular deactivating or not maintaining an EGR or reagent dosing system. The instructions shall be written in a clear and non-technical manner using the same language as is used in the operator’s manual on non-road mobile machinery or engine. when the reagent in the storage tank does not comply with the characteristics declared and recorded in section 2.2.1.13 of Appendix 1 and section 2.2.1.13 of Appendix 3 to Annex II, according to the installed means of assessment. when the dosing activity of the reagent is interrupted, in cases other than those executed by the engine ECU or the dosing controller, reacting to engine operating conditions where the dosing is not required, provided that these operating conditions are made available to the type approval authority. direct means, such as the use of a reagent quality sensor. indirect means, such as the use of a NOx sensor in the exhaust to evaluate reagent effectiveness. 1.1. This Annex describes the method of determining emissions of gaseous and particulate pollutants from the engine to be tested. for engines intended for propulsion of locomotives an NRSC shall be used for the measurement of gaseous and particulate pollutants for stage IIIA and for stage IIIB. the second time (hot start) after a twenty-minute hot soak that commences immediately after the completion of the cold start cycle. During this test sequence the above pollutants shall be examined. The test sequence consists of a cold start cycle following natural or forced cool-down of the engine, a hot soak period and a hot start cycle, resulting in a composite emissions calculation. Using the engine torque and speed feedback signals of the engine dynamometer, the power shall be integrated with respect to the time of the cycle, resulting in the work produced by the engine over the cycle. The concentrations of the gaseous components shall be determined over the cycle, either in the raw exhaust gas by integration of the analyser signal in accordance with Appendix 3 to this Annex, or in the diluted exhaust gas of a CVS full-flow dilution system by integration or by bag sampling in accordance with Appendix 3 to this Annex. For particulates, a proportional sample shall be collected from the diluted exhaust gas on a specified filter by either partial flow dilution or full-flow dilution. Depending on the method used, the diluted or undiluted exhaust gas flow rate shall be determined over the cycle to calculate the mass emission values of the pollutants. The mass emission values shall be related to the engine work to give the grams of each pollutant emitted per kilowatt-hour. The load figures are percentage values of the torque corresponding to the prime power rating defined as the maximum power available during a variable power sequence, which may be run for an unlimited number of hours per year, between stated maintenance intervals and under the stated ambient conditions, the maintenance being carried out as prescribed by the manufacturer. For propulsion engines (6) intended to be used in inland waterway vessels the ISO test procedure as specified by ISO 8178-4:2002 and IMO MARPOL 73/78, Annex VI (NOx Code) shall be used. Propulsion engines that operate on a fixed-pitch propeller curve shall be tested on a dynamometer using the following 4-mode steady-state cycle (7) developed to represent in-use operation of commercial marine diesel engines. (the high speed is the highest engine speed where 70 % of the rated power is delivered, while the low speed is the lowest engine speed where 50 % of the rated power is delivered). If the measured reference speed is within +/– 3 % of the reference speed as declared by the manufacturer, the declared reference speed may be used for the emissions test. If the tolerance is exceeded, the measured reference speed shall be used for the emissions test (10). 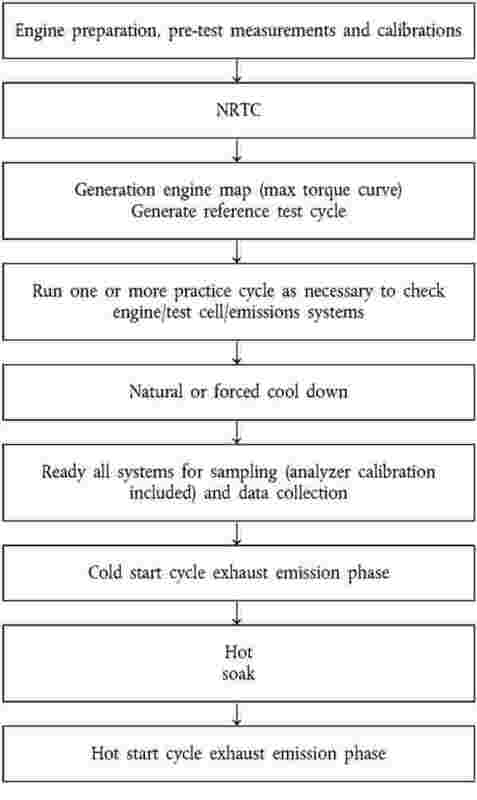 One or more practice cycles may be run as necessary to check engine, test cell and emissions systems before the measurement cycle. At least one hour before the test, each filter shall be placed in a petri dish, which is protected against dust contamination and allows air exchange, and placed in a weighing chamber for stabilisation. At the end of the stabilisation period, each filter shall be weighed and the weight shall be recorded. The filter shall then be stored in a closed petri dish or sealed filter holder until needed for testing. The filter shall be used within eight hours of its removal from the weighing chamber. The tare weight shall be recorded. The instrumentation and sample probes shall be installed as required. The tailpipe shall be connected to the full-flow dilution system, if used. The dilution system shall be started. The total diluted exhaust gas flow of a full-flow dilution system or the diluted exhaust gas flow through a partial flow dilution system shall be set to eliminate water condensation in the system, and to obtain a filter face temperature between 315 K (42 °C) and 325 K (52 °C). The particulate sampling system shall be started and run on by-pass. The particulate background level of the dilution air may be determined by sampling the dilution air prior to entrance of the exhaust into the dilution tunnel. It is preferred that background particulate sample be collected during the transient cycle if another PM sampling system is available. Otherwise, the PM sampling system used to collect transient cycle PM can be used. If filtered dilution air is used, one measurement may be done prior to or after the test. If the dilution air is not filtered, measurements should be carried out prior to the beginning and after the end of the cycle and the values averaged. A natural or forced cool-down procedure may be applied. For forced cool-down, good engineering judgement shall be used to set up systems to send cooling air across the engine, to send cool oil through the engine lubrication system, to remove heat from the coolant through the engine cooling system, and to remove heat from an exhaust after-treatment system. In the case of a forced after-treatment cool down, cooling air shall not be applied until the after-treatment system has cooled below its catalytic activation temperature. Any cooling procedure that results in unrepresentative emissions is not permitted. The cold start cycle exhaust emission test may begin after a cool-down only when the engine oil, coolant and after-treatment temperatures are stabilised between 20 °C and 30 °C for a minimum of 15 minutes. The test sequence shall commence with the cold start cycle at the completion of the cool-down when all the requirements specified in section 4.5.6 are met. The engine shall be started according to the starting procedure recommended by the manufacturer in the owner's manual, using either a production starter motor or the dynamometer. As soon as it is determined that the engine is started, start a “free idle” timer. Allow the engine to idle freely with no-load for 23 ± 1 s. Begin the transient engine cycle such that the first non-idle record of the cycle occurs at 23 ± 1 s. The free idle time is included in the 23 ± 1 s.
The test shall be performed according to the reference cycle as set out in Annex III, Appendix 4. Engine speed and torque command set points shall be issued at 5 Hz (10 Hz recommended) or greater. The set points shall be calculated by linear interpolation between the 1 Hz set points of the reference cycle. Feedback engine speed and torque shall be recorded at least once every second during the test cycle, and the signals may be electronically filtered. If raw exhaust measurement is used, the emission concentrations (HC, CO and NOx) and the exhaust gas mass flow rate shall be measured continuously and stored with at least 2 Hz on a computer system. All other data may be recorded with a sample rate of at least 1 Hz. For analogue analysers the response shall be recorded, and the calibration data may be applied online or offline during the data evaluation. If a full flow dilution system is used, HC and NOx shall be measured continuously in the dilution tunnel with a frequency of at least 2 Hz. The average concentrations shall be determined by integrating the analyser signals over the test cycle. The system response time shall be no greater than 20 s, and shall be coordinated with CVS flow fluctuations and sampling time/test cycle offsets, if necessary. CO and CO2 shall be determined by integration or by analysing the concentrations in the sample bag collected over the cycle. The concentrations of the gaseous pollutants in the dilution air shall be determined by integration or by collection in the background bag. All other parameters that need to be measured shall be recorded with a minimum of one measurement per second (1 Hz). At the start of the engine the particulate sampling system shall be switched from by-pass to collecting particulates. If a partial flow dilution system is used, the sample pump(s) shall be adjusted so that the flow rate through the particulate sample probe or transfer tube is maintained proportional to the exhaust mass flow rate. If a full flow dilution system is used, the sample pump(s) shall be adjusted so that the flow rate through the particulate sample probe or transfer tube is maintained at a value within ± 5 % of the set flow rate. If flow compensation (i.e. proportional control of sample flow) is used, it must be demonstrated that the ratio of main tunnel flow to particulate sample flow does not change by more than ± 5 % of its set value (except for the first 10 seconds of sampling). NOTE: For double dilution operation, sample flow is the net difference between the flow rate through the sample filters and the secondary dilution airflow rate. If the engine stalls anywhere during the cold start test cycle, the engine shall be preconditioned, then the cool-down procedure repeated; finally the engine shall be restarted, and the test repeated. If a malfunction occurs in any of the required test equipment during the test cycle, the test shall be voided. At the completion of the cold start cycle of the test, the measurement of the exhaust gas mass flow rate, the diluted exhaust gas volume, the gas flow into the collecting bags and the particulate sample pump shall be stopped. For an integrating analyser system, sampling shall continue until system response times have elapsed. The particulate filters shall be returned to the weighing chamber no later than one hour after completion of the test. They shall be conditioned in a petri dish, which is protected against dust contamination and allows air exchange, for at least one hour, and then weighed. The gross weight of the filters shall be recorded. Immediately after the engine is turned off, the engine cooling fan(s) shall be turned off if used, as well as the CVS blower (or disconnect the exhaust system from the CVS), if used. Allow the engine to soak for 20 ± 1 minutes. Prepare the engine and dynamometer for the hot start test. Connect evacuated sample collection bags to the dilute exhaust and dilution air sample collection systems. Start the CVS (if used or not already on) or connect the exhaust system to the CVS (if disconnected). Start the sample pumps (except the particulate sample pump(s), the engine cooling fan(s) and the data collection system. The heat exchanger of the constant volume sampler (if used) and the heated components of any continuous sampling system(s) (if applicable) shall be preheated to their designated operating temperatures before the test begins. Adjust the sample flow rates to the desired flow rate and set the CVS gas flow measuring devices to zero. Carefully install a clean particulate filter in each of the filter holders and install assembled filter holders in the sample flow line. The test shall be performed according to the reference cycle as set out in Appendix 4 to Annex III. Engine speed and torque command set points shall be issued at 5 Hz (10 Hz recommended) or greater. The set points shall be calculated by linear interpolation between the 1 Hz set points of the reference cycle. Feedback engine speed and torque shall be recorded at least once every second during the test cycle, and the signals may be electronically filtered. The procedure described in previous sections 4.5.7.2 and 4.5.7.3 shall then be repeated. If the engine stalls anywhere during the hot start cycle, the engine may be shut off and re-soaked for 20 minutes. The hot start cycle may then be rerun. Only one hot re-soak and hot start cycle restart is permitted. At the completion of the hot start cycle, the measurement of the exhaust gas mass flow rate, the diluted exhaust gas volume, the gas flow into the collecting bags and the particulate sample pump shall be stopped. For an integrating analyser system, sampling shall continue until system response times have elapsed. (1) IMO: International Maritime Organisation. (3) Identical with C1 cycle as described in paragraph 8.3.1.1 of ISO 8178-4:2007 standard (corrected version 2008-07-01). (4) Reference speed is defined in section 4.3.1 of Annex III. (5) Identical with D2 cycle as described in paragraph 8.4.1 of the ISO 8178-4: 2002(E) standard. (6) Constant-speed auxiliary engines must be certified to the ISO D2 duty cycle, i.e. the 5-mode steady-state cycle specified in section 3.7.1.2, while variable-speed auxiliary engines must be certified to the ISO C1 duty cycle, i.e. the 8-mode steady-state cycle specified in section 3.7.1.1. (7) Identical with E3 cycle as described in Sections 8.5.1, 8.5.2 and 8.5.3 of the ISO 8178-4: 2002(E) standard. The four modes lie on an average propeller curve based on in-use measurements. (8) Identical with E2 cycle as described in Sections 8.5.1, 8.5.2 and 8.5.3 of the ISO 8178-4: 2002(E) standard. The OEM shall provide the approval authority with any information connected with the implementation of the flexibility scheme that the approval authority may request as necessary for the decision.